I’ m sharing this article from http://www.bookyourdive.com to remind me again to be always a good dive buddy, I have always love diving and I become particular how to behave properly underwater. A dive buddy is someone with whom you share your diving experience in order to prevent emergencies and solve problems when they occur. 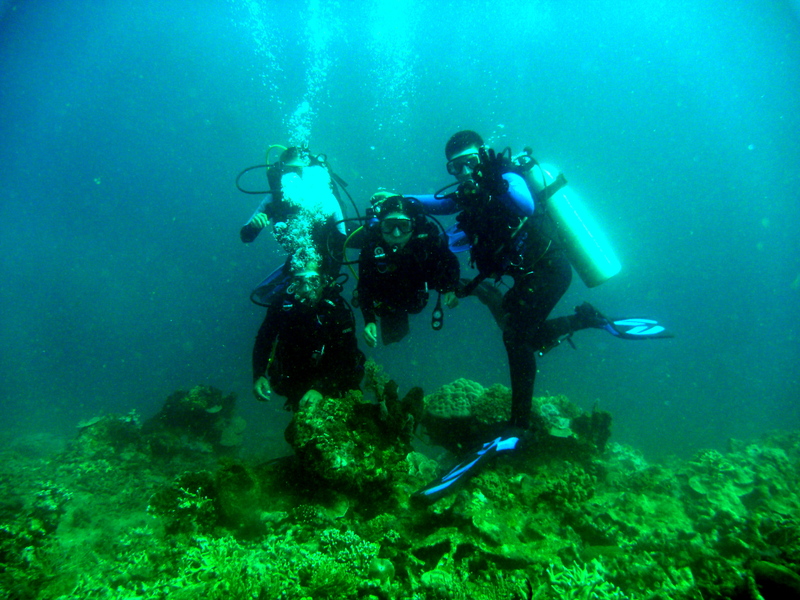 The buddy system is used by divers to make sure that someone is always there, helping to maintain the safety of the other buddy throughout the entire dive. What It Means To Be a Good Dive Buddy. Whenever you go diving, it is important to have a dive buddy that you can trust from the time you are on the boat to the time you dive into the water and then return to the boat or shore at the end of your dive. You definitely want to have a buddy with you, to share the fun with you and be there in the event of an emergency. In the same way, you need to learn how to be a good buddy to someone else, because you want to be able to help someone in need and make sure that you can help him/her enjoy his/her dive. Here are some tips on how to be a good dive buddy. A good dive buddy takes safety seriously. He or she is someone who is knowledgeable about scuba safety, knows how to use diving safety devices, and is willing to perform the Pre-Dive Safety Check before each and every dive. By showing that he or she is concerned about safety, a dive buddy will put his or her buddy at ease and will create a level of confidence that can lead to an even higher level of enjoyment throughout the dive. Another quality of a good dive buddy is someone who communicates well both on land as well as in the water. Try to establish signals that you both can use before you head down into the water, so that while diving, you will be able to understand each other’s gestures more easily and not be left confused by each other’s hand signals. A good buddy is someone who communicates how close or how far he or she is willing to be from his or her buddy, and this will also be important to know during the dive. 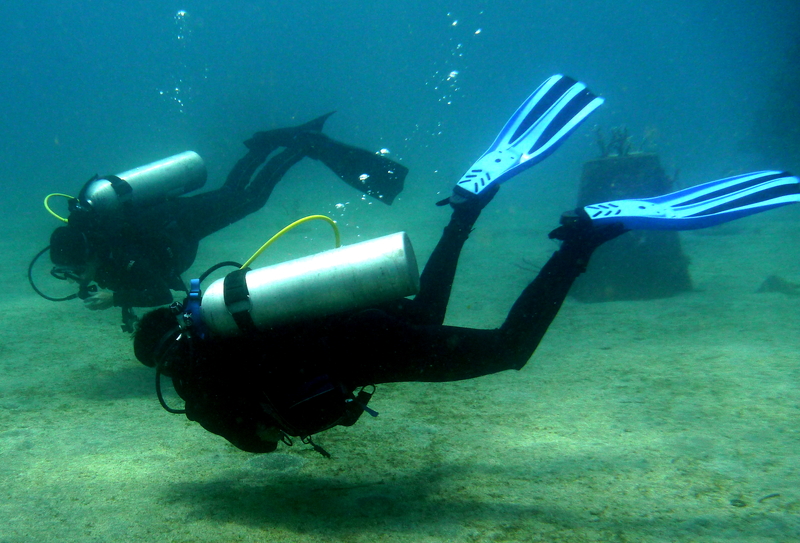 Before a dive, a good buddy will establish what he or she prefers while he or she is diving. For example, the dive buddy should state whether he or she likes to drift along from a distance or get closer to a site. A good buddy will be one who shares the same feelings about how to experience a dive. A dive buddy will also be around the same skill level as his or her diving partner. In this way, one will not be held back or forced to go too quickly by the other. Having a similar skill set will allow both divers to experience the dive from similar perspectives, and it can lessen the odds of conflicts regarding how fast or how far to swim during the dive. There is always that element of partnership in every dive. In everything we do, there are always good practices that we must consistently uphold – whether in business, work or even practicing one’s profession. Ethics is even important in Diving, this is a good piece to reflect on if I am a good dive buddy every time I’m in the depths. I am sharing this article written by DM Dennis Jacobson. 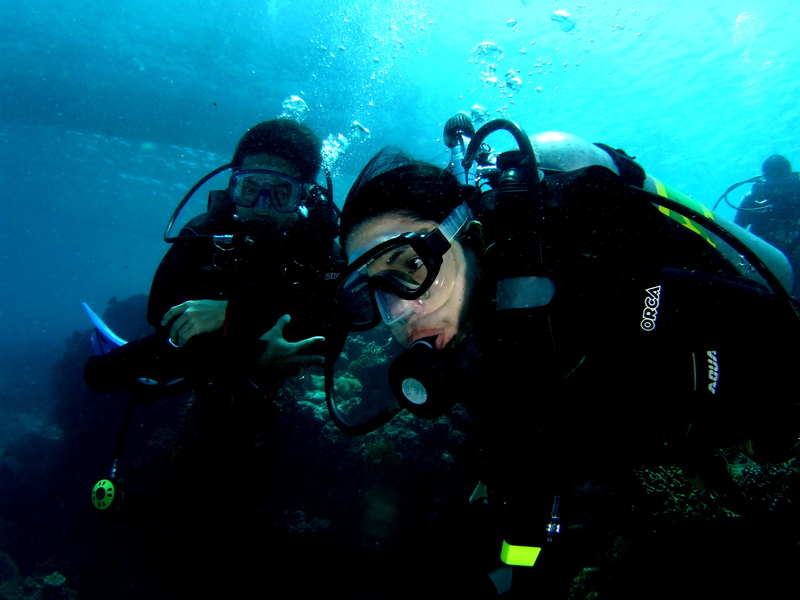 While there are some divers who have trained and are certified to dive alone, we have all been taught that safe diving means diving with a buddy. Not only is it safer than diving alone, but sharing a dive with a partner multiplies the pleasure of the dive by having someone to share the experiences and verify the exciting encounters and sightings. I am lucky to have my wife Debbie as my dive buddy. She and I know each other’s dive habits, we work well together as a team, and we have become very adept at not only staying close together, but also being aware of each other’s position, activity, and, should they arise, issues throughout the dive. Some people seem to think that getting in the water about the same time as your buddy, and staying in the same ocean as they are, constitutes buddy diving. They are wrong. To be a good dive buddy, someone with who other people enjoy diving and look for to diving with in the future, you should take being a buddy a bit more seriously. A good dive buddy stays close to his or her dive partner all the time. Just how close varies with conditions like visibility, current, how well you know your buddy, whether you have dove together in the past, and other relevant factors. But on every dive, your should be close enough you can respond to your dive buddy in the event of any emergency or need for assistance arising. Emergencies are not limited to air depletion. They can include entanglement, equipment malfunction, injury, or even coming under attack from an aggressive sea creature. Stay close enough to help a buddy out. A good dive buddy not only stays in close proximity to their dive partner, they are aware of their buddy’s location and activity, direction of travel if moving, and can perceive any problems, confusion, unease, or distress a buddy may exhibit as it occurs or just moments after. It doesn’t take long for buddies to become separated if they are not focused on and have an awareness of where each other is and what the other is doing and how they are moving. Buddy diving is kind of like going on a date. If you take a date to a dance, it is bad manners to lose them on the dance floor. Good manners require that you pay attention to them. If you don’t, you might look up to find they are no where around. It’s the same in buddy diving. Pay attention to your buddy. Look around and mark your buddy’s’ location and activity regularly, in fact, often, and better still, constantly. Part of being a good dive buddy is being sensitive to your dive buddy’s feelings, including how he or she feels physically and whether they are feeling stressed or anxious about doing a dive. Don’t pressure your buddy to do a dive that they don’t want to do. Sometimes a diver is not comfortable doing a dive. Let it go. Similarly, if a problem arises during a dive that leads to one buddy wanting to terminate, or “thumb” the dive, a good dive buddy will go with them. Never leave a distressed, injured, confused, stressed out, or tired buddy to fend for themselves, even if they are surfacing and returning the boast or shore. A good dive buddy will get acquainted with his diving partner before the dive. Sometimes we get paired up with a stranger, what some call an “insta-buddy.” When that happens, you need to get to know each other as divers. Talk to each other. Learn about each other’s experience level and last dive. Clarify the communications you will use and agree as to proximity and other buddy coordination. Discuss your objectives for the dive. Are you going to swim around like crazy people or focus on looking at the animals and their behaviors? If one or both are going to take pictures or video, discuss expectations you each have for staying close. When diving with a new buddy (or any buddy for that matter) a good dive buddy will be sure to sure to do a pre-dive safety check, familiarizing the team with each other’s equipment. Just like you learned to do in your basic scuba certification class. There is no need to dive with a stranger if you take a few minutes to plan together, learn bout each other and communicate about the dive. Too often, divers who are paired up by the divemaster or boat captain, or even those who may have selected each other as buddies, will introduce themselves to each other, and then be oblivious to each other throughout the dive. That is not a good idea. A dive buddy who appreciates the importance of that role will stay close, be aware of what is going on, never have a problem with buddy separation, and be there to share air, help his buddy get untangled from the kelp, notice symptoms of narcosis, and otherwise assist as needed. If you want to have a good dive buddy, be a good dive buddy. You can do it. I know you can. Dennis Jacobson is a full-time lawyer and part-time divemaster who lives in Colorado but escapes to the tropics for diving whenever he can. He and his wife Debbie, who has been diving for ten years herself, are the authors of The Scuba Snobs Guide to Diving Etiquette, and The Scuba Snobs Guide to Diving Etiquette BOOK 2. Both are available in paperback or as an e-book on amazon.com and many other on-line book sellers. DM Dennis is a popular blogger on scubaboard.com, and has written articles for several scuba publications in addition to the two books he and his wife have published.